To make dough, in a mixer with the dough hook attachment, combine flour, salt and baking powder. On low speed, add remaining ingredients until dough is smooth. Cover dough and let rest in a cool place for at least one-half hour. To make filling, sauté mushrooms in oil and butter on medium-high heat for 2 minutes. Reduce heat to medium and add remaining ingredients except cheese; sauté until no moisture remains. It is very important that the mixture is not wet. Transfer to a large bowl; cool. Add cheese and mix well. For each serving, to order, cook 6 pierogi in salted boiling water for 2-3 minutes. In a nonstick pan, melt 1 tablespoon butter and sauté pierogi until golden on both sides. 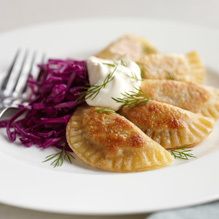 Arrange pierogi on plate and garnish with 1 tablespoon sour cream, 1 teaspoon dill and 1/4 cup red cabbage.